Another year, another Fall-In convention. 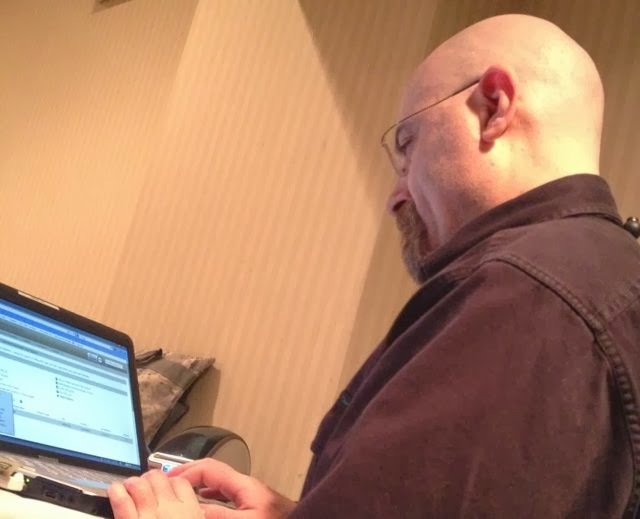 The more conventions I go to, the less new and different I have to say about them, so I’m going to go over some of the “big picture” items that I usually ignore, and only briefly cover the events themselves. Gaming conventions are great fun, and they’re a wonderful way to get a big dose of gaming in over the course of the weekend. I learn more in a weekend at the convention than the entire time between conventions. My room for Cold Wars 2014 is already reserved, and I should probably go book for Fall-In as well. As usual in recent years, I played nothing but DBx games: DBA and HotT. Fall-In is the smallest of the HMGS-East conventions, but there are enough players and GMs to field a full schedule of DBA and HotT games, from Thursday evening to Sunday morning with minimal breaks. All the DBA games were run using 2.2+. Nobody plays 2.2 anymore, and 3.0 isn’t released yet. 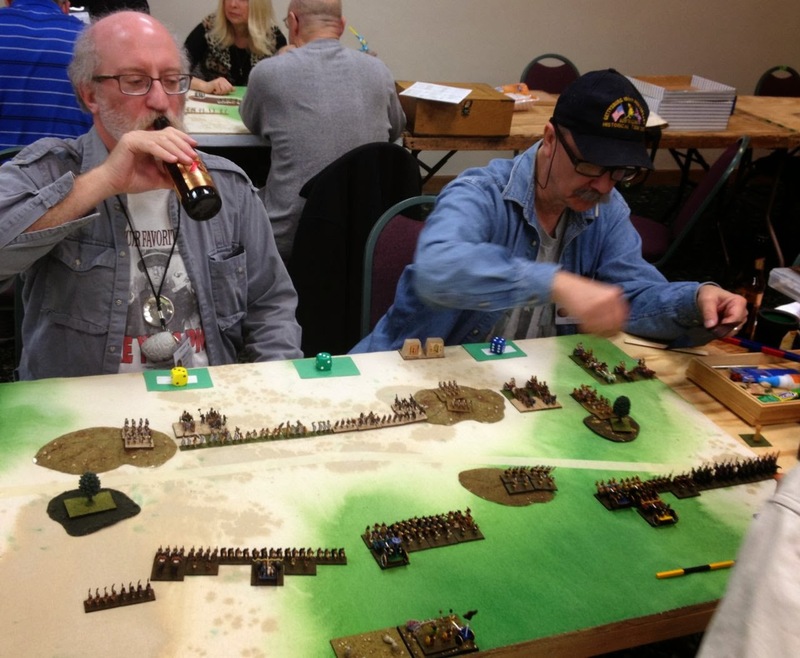 Ancient and Medieval wargaming is in a bit of a funk at the conventions these days. Although we have enough players to fill DBA tournaments, there is very little support in the vendor hall. The space where Wargames Minis used to be is still a huge hole in the back of the hall, and many other vendors seem not to bring their 15mm ancient and medieval figures in recent years. If you’re interested in buying painted armies, there seems to be a big selection of DBA armies in the flea market; so there’s that, at least. Luckily, Gale Force 9 have their bulk MDF bases back in stock, hopefully permanently. I stocked up on 25mm scale HotT bases on Friday before they ran out. As I paint more armies, each army I paint becomes less and less useful to my overall collection. When I had 2 armies, painting a third was a huge benefit: on average it would see use 1/3 of the time. Now that I have over 30 armies, each new army I paint provides only a minuscule benefit over the ones I have. I play DBA so infrequently outside of conventions that the only way I can guarantee I’ll play an army is if I paint it for a specific themed event. With that in mind, I built 3 armies in preparation for Fall-In 2013. I painted Neo-Assyrian Later Sargonid for BBDBA, but didn’t end up using it. The Two Davids campaign event always provides a good motivation to paint a new army, so I painted Georgians. There wasn’t any other event at the same time as the 25mm DBA event, so I rebased a 25mm Early Polish army, though I didn’t paint the figures. Mark Bumala is annoyed that Rich forgot the terrain mats. Every convention, The Stooges from Pittsburgh run a Prologue event: an element-themed tournament on Thursday night. This time around the theme was “Long Pointy Things.” Eligible armies required at least 4 elements of Pike. These aren’t historical formats, and don’t tend to produce historical matchups. They often result in fairly balanced army matchups, but some metagamers try to turn it into an “armies that beat the element theme” event. After winning 3 rounds undefeated, John Manning’s nearly naked Sumerians carried their Long Pointy double entendres to victory. I brought Seleucids. Although I tend to consider Alexander and his Successors as the main source of DBA Pike armies, I didn’t face any other Classical pikes. 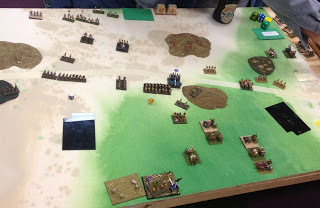 John Manning beat me with his Sumerians; I beat Mark Bumala’s Low Countries; and Roland Fricke beat me 5-3G in a very close battle with his Low Countries army. I really like the later Sumerian army, but it’s only because their heavy chariots are donkey-pulled 4-wheel carts. At this point, the army composition is so similar to a Successor army that I just can’t justify painting the army without a themed event to play it in. The first Bookend event is Big Battle Doubles, held all day on Friday. Typically this event is run in two separate player pools, using either round-robin or swiss pair matchups in each group depending on the player count. After three preliminary rounds, the winners of each pool are supposed to play a final to determine the overall winner. In recent conventions they’ve been using a historical theme, and this time around it was chariot-era biblical armies. Team Two Davids won their pool as they usually do. Spencer Ginder and his wife, team Comedy and Tragedy, won the other pool. Since both teams live in the DC area, they decided to finish the final outside the convention. I haven’t heard the final results yet. I partnered with Jack Sheriff, making him the second player I’ve partnered with more than once. We formed The Team With No Name, despite Dave Schlanger’s attempt to retcon us into The Team Who Shall Not be Named. I’d be happy to join forces with him again; we both have the right combination of laid back but competitive. We decided to take Neo-Assyrian Later Sargonid with a Saitic Egyptian ally. I planned to paint a Sargonid army with an ally for BBDBA before I partnered with Jack, but he had the army so I didn’t need to finish painting it. 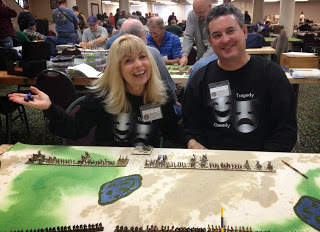 In the first round, we faced Mark Burton and John Svensson, whose team name I forget, and their Lydian army. They defended and tried a bold, daring deployment that put most of their forces on our weaker right flank, but exposed their commander in chief on the end of their line. Truthfully, they put up a good fight and lasted several turns longer than I anticipated; but they lost in the end. We won 78-22. In the second round, we faced team Comedy and Tragedy and their New Kingdom Egyptians. We lost 2-98. Versus The Stooges. Before: Deployment. We were determined to take our lessons learned into the third round, where we also faced New Kingdom Egyptians with the same composition. This time, they were piloted by the Stooges: Larry Chaban and “Diceman” Rich Baier from Pittsburgh. I came all this way to fight you? Jack Sheriff is known as “the butcher,” and in this game we all helped him earn his title. In the end we lost 41-59, but it was one of the closest BBDBA matches I’ve seen. We were close to testing whether it was possible to gain more points as a loser than as a winner. Versus The Stooges. After: Carnage. The victory conditions for BBDBA say that you win if you have broken the enemy’s C-in-C command, or have killed more than half the enemy’s elements and also have more elements killed than they do. Big Battles uses a triple army, 36 elements, so half the elements are 18. Near the end of this game, we were tied 17 elements to 17. They broke one of our commands early on, but we broke two of theirs shortly after. It was their turn, which meant that it was their turn for their elements to flee off the board, but also their turn to attack us and kill more elements. Unfortunately they were able to kill 18 elements before we could catch up, securing their victory. They won 19G-17G/CinC: a Pyrrhic victory if there ever was one. After this battle of epic proportions, the four of us decided to go to dinner rather than participate in the Friday evening event. On Roland’s advice, we drove a few miles away to a “Mexican” restaurant. This turned out to be a high quality Latin-American restaurant that was an absolutely amazing find for Lancaster, PA: El Serrano. After the loss of the Thai restaurant, and Tony Wang’s going down hill, it was great to find another place to eat good food. I had the Lomito and two excellent Margaritas, and didn’t regret missing a DBA event for the experience. On Saturday, I ran a Pyramid event. In this format, the loser of the each round joins forces with the winner in a multi-army battle in the next round. The 8-player pyramid results in 3 rounds culminating in an 8 player 4-on-4 battle. This time around, I chose an Alexandrian Successor theme. In the final round, Larry Chaban as C-in-C of the Athenian Empire defeated Dan Loych, C-in-C of the Ptolemaic Empire, to secure Greek dominance over their Macedonian underlings. A new target! I mean, Otto. Saturday afternoon, there was only one event: a 25mm book II/III tournament. I usually don’t play 25mm, but 2.2+ normalized the rules across 15mm and 25mm, so I decided to take an army rather than do nothing. I could have taken my Early Spartans, but a wall of spears with a single Psiloi is fairly boring. I decided to rebase some painted Medieval figures I had into an Early Polish army, instead. 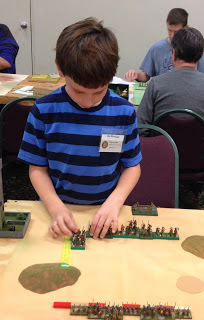 In the first round, I beat John Svensson’s Normans 4-0. 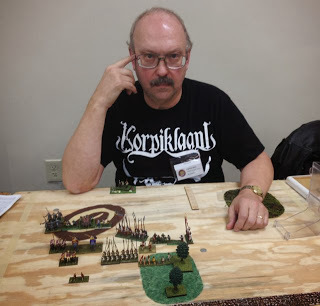 Next I faced Jeff Franz and his Skythians; he didn’t roll enough 6’s for PIPs, so I beat him 3G-1. Finally, I faced John Manning’s Hsia-Hsia and won 4-2 to end in an undefeated victory. And so, I qualified for the NICT again even though I am unable to attend Historicon. Saturday Night is the other Bookend event: the Two Davids Campaign Theme. This convention, the theme was God Wills It!, a Crusader theme. I played the Georgians, alone in the corner as usual. I’m not very good at parties. I never took a vassal, but I won 2 rounds out of 5 (“Beat up on kids” according to Larry), killed a general, and ended the game independent, netting me 7 points and a solid middle-of-the-pack position. Sunday Morning, instead of going to Perkins for their extreme bowel cleansing service, I decided to play the Hordes of the Things open. I brought Professor Hans’ Metal Minions. I won one round and lost 2. 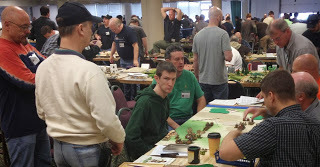 Scott Kastler’s magician army was a very interesting opponent. It was another great convention, and I look forward to Cold Wars in March. In the mean time I have at least 3 DBA armies to paint, and I plan to field a new HotT army for the Sunday open as well. You should join us! It’s fun, and there’s beer.